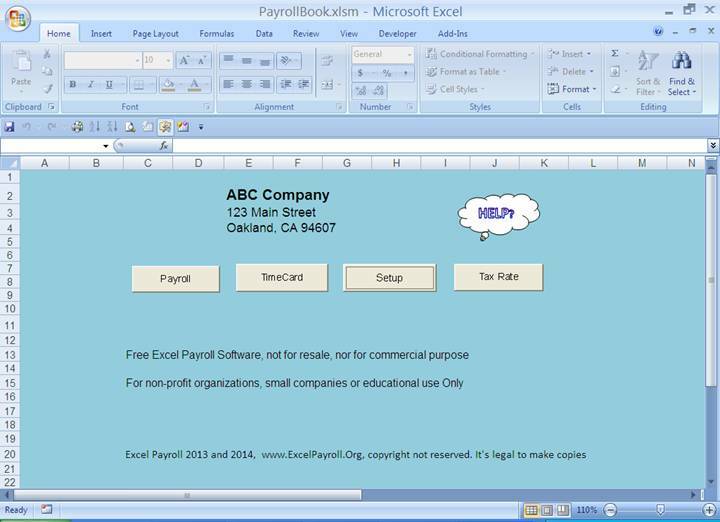 a. Excel Payroll.zip includes Four (4) Excel files: PayrollBook.xlsm, Payroll Record.xlsm, PRRecord.xlsm, and Payroll Time Card.xlsm. These four files must be in the same folder. You may change the folder name or path; but do not change the names of the files. That’s all you need to do! No installation is needed! Click the return sign [Save] or [Cancel] to return to previous page when finish. Please see the sample company information entered in the default setting. You can only enter information in the green areas. The pink areas (cells) are to be computed by Excel macro. Deduction: please note that there is no need to enter the deduction items if you don’t have any. If you check a tax item the deduction is not subjected to that tax when such a deduction incurred. The right column shows the maximum amount for each employee can deduct during the payroll year. Please see the sample entered. Payroll Period: You may select different payroll periods from weekly, bi-weekly, monthly quarterly, or annually. This is for payroll tax computation purpose only. It has nothing to do with when and how often you pay your employees. Standard Check: Check format preset for QuickBook, Quicken, Peachtree, SBT, Great Plains, Platinum, and other self-design check formats. You may select one of them to print your check. You may even make adjustments after your selection if the print-outs do not match the positions on your check. After you clicked the [Check Setup] button, (see figure 3) what you need to do is to drag and move the selected information you want to where you want to print on your computer check. After you selected, moved, or formatted the information you prefer, please make sure you select and set the Print Area, under “Page Layout”=> “Print Area” => “Set Print Area”. Also you may use Excel menu to do a few test print pages to make sure the information printed properly at the right positions on your check. The information in red ink is only the description for you to understand as a note. They won’t change during the payroll process. The information in black ink will change from check to check (or payee to payee). In case you forgot the description, or messed up with the information, or want to reset your check design, you may click the [Restore Default] button to restore the information and the positions back to where they were before. You change the width, high or positions of the printing information. Click [Return] when finish your check setting. You may save your settings through Excel when you make changes. Make a test print and generally you should only set to print one page per check print. Renew Button (figure 2): This button is for renewing or upgrading your program. You only need to renew the program when it comes to expiration or upgrading is needed. You don’t need to renew or upgrade it unless you want. You only need to use this button once a year. However, you must close the year after December 31st of the payroll year or after the last payroll check was printed before you can select a new payroll year. It is a good idea to process some dummy entries, cut some dummy payroll checks, and generate some reports; then close the year. Try this a few times to practice before use. Once you close, you may select a new year. Type the word “close” to confirm the closing. You may do this as many times as you want when you are practicing on this payroll. Select Payroll Year: (figure 2): You can select a new payroll year after you close the year. 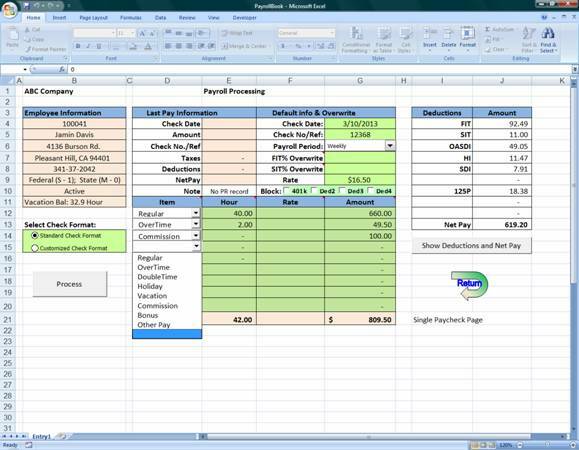 You may use this program to redo your previous years of payroll (for keeping record purpose). You can always select 7 years backward and 2 years forward. 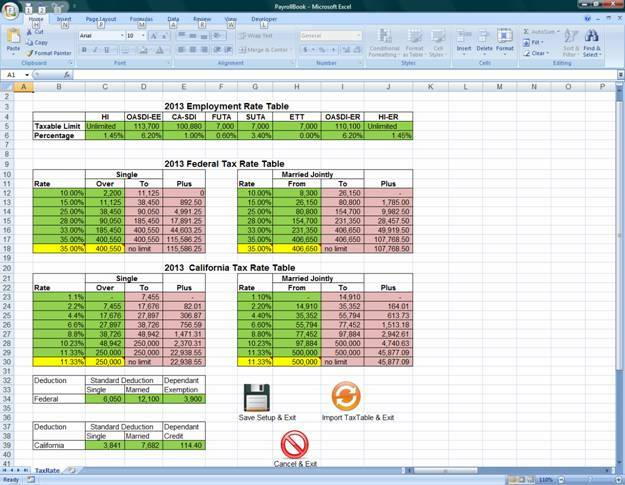 You will get this 20XX Tax Table.xlsx file every year at www.ExcelPayroll.Org at the end of each year to update your tax table automatically. 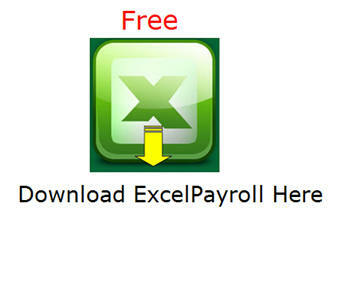 Make sure you put this file in the same directory of your payroll program. Once you click on this button, the program will search the same year as you selected in the setup page. So make sure you select a new payroll before you click this button or your rate will not be updated to the latest year. A special feature of this program is that you can cut a payroll check at any time. Unlike ADP or other payroll program that you have to select a pay period or to define a pay date before you can print a check, there is no payroll period or payroll date to select. You can enter any date as payroll date on the payroll check. Your payroll liabilities occur as the same dates as your payroll check dates. You may even reprint or redo your old payroll records in back years. For example, if today is June 23, 2018 you may redo your payroll for January 2011 as if you were paying in 2011 for record keeping purpose. Step 1: Select an employee in the selection dialog window and then click the [Pay] button. The pay period (pay frequency) is shown as what you selected in the setup page. But you may change it for a particular purpose for each individual employee during the payroll. For example, if you had selected a weekly payroll but you are paying a commission on this paycheck that is only happening once a month, you may want to select “monthly” for this particular paycheck so that the amount of payroll taxes can be properly withheld. Income tax withholding (FIT and SIT) may also be overwritten if you enter percentages in this adjustment area (see figure 9). You may also block deductions for some checks. The rate is the default rate when you add/edit an employee in the employee record. If you want to change the rate for this particular paycheck you may do so. Select the type of pay in the Item column and enter the hours in decimal format in the next Hour column (green area section). There is no need to enter a rate in the Rate column if the rate is the same as the default rate in cell “G9”(the default rate is being used if it is blank or zero). You may enter a new rate for a particular type of time for this pay if it is different from the default. The Amount column will be calculated by the new rate if it is entered. If you enter an amount in the Amount column, then no hour or rate should be entered. For example, if you are paying $500 commission for the employee you may not enter the hour or rate but just the amount. So you will leave the hour and rate columns blank , and only enter $500 in the Amount column. 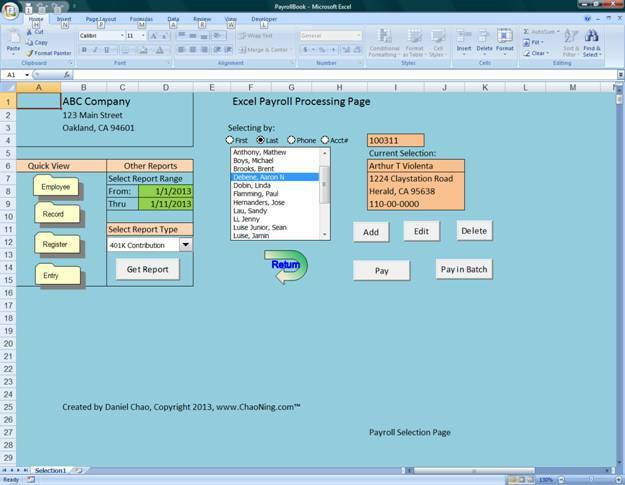 You may select the “Standard” or the “Customized” format to print your payroll check. If you have already paid the employee with a manual check or if this is an old payroll record to redo the process, then you may want to choose “No” without printing an actual check while the payroll is recorded in this payroll program. Click on [No] if do not wish to reprint the check again. VI. To view an employee Record, Employee List, View Entry, Payroll Register, or print 940 and 941 Report. Open PayrollBook.xlsm to start your payroll process. In fact, you should always open this file to begin your payroll process and you will not need to deal with the other three files. The other three files are the working files that support PayrollBook.xlsm within the macro program. There are three kinds of data files: Timecard (employee timecard daily hour records), Payroll record and Payroll register, and Job Costing files. You may open these files at any time for your own use. 1, time sheet file: its format as “WKYY-MM-DD .xlsx” (example: “WK12-11-16.xlsx” payroll time card data for week ending Nov. 16, 2012). It is saved when you post the weekly time card. 2, payroll record and register file: All the current (year) data are kept in the “Payroll Record.xlsm” programming file until you close the year. Once you close the payroll year, payroll records and register are posted into a file “Payroll Data Year YYYY.xlsm” (where YYYY is the year, such as “Payroll Data Year 2012.xlsm”). Please note that a payroll must be closed after December 31 before you can start/select a new payroll year. 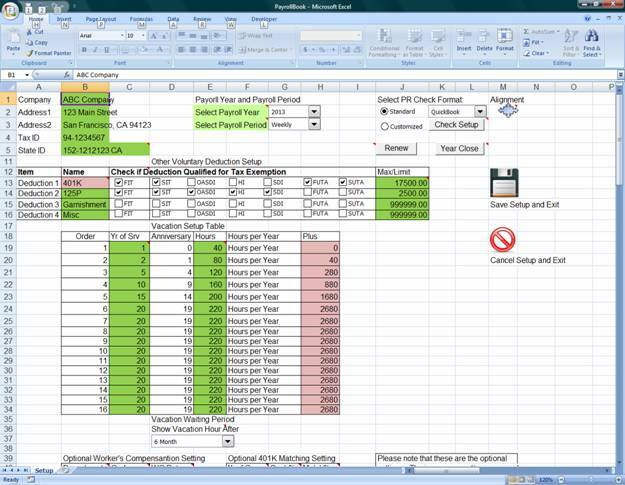 3, job costing file: All the current (year) data is kept in the “Payroll Time Card.xlsm” programming file until you extract the data for your own use. Data is saved in “CostYYMMDD.xlsx” (example “Cost121201.xlsx” containing all data from last saved to December 1, 2012). It lists job numbers, direct labor hours used by employees, and by types of equipment used. It is highly recommended that you should practice on the program a few times before you starting printing a real payroll check. 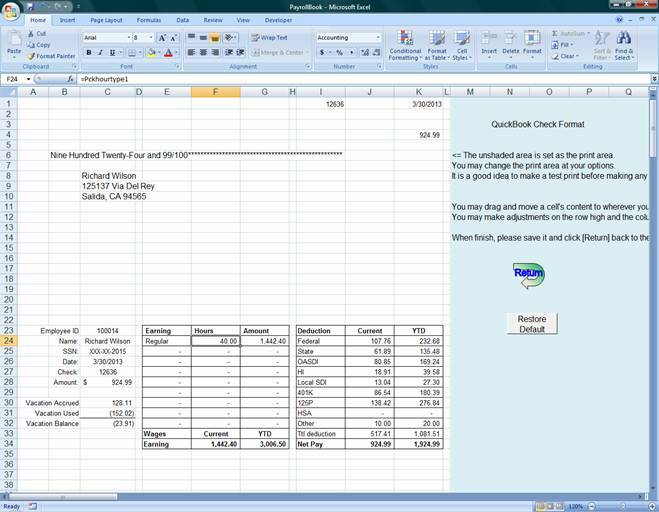 Select QuickBook check in the standard format. Leave all other settings as they are. Click on [Save] when finish. 3. Delete Linda and put Peter as inactive employee. Step 1: Select Linda (highlighted Linda) in the selection window and make sure Linda’s information is shown in the display window on the upper right corner. Step 3: Click on “Yes” from the pop-up message to confirm the deletion. Step 6: Click on [Show Deductions and Net Pay] to view the total or detail. 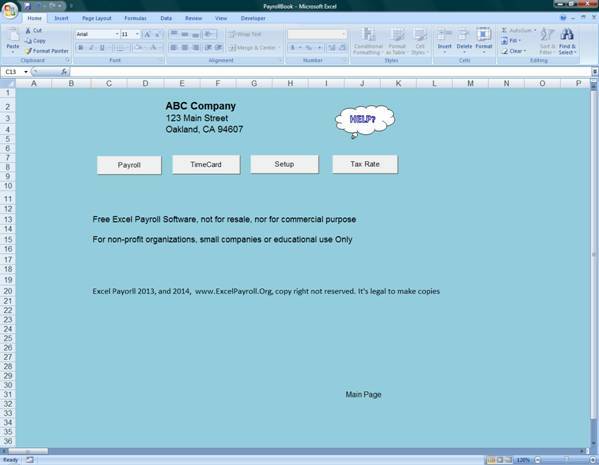 Step 8: Click on [Process] button to process the payroll and click “Yes” to print a check. Note: Step 6 and 7 are an optional; you may skip them to Step 8 if you are sure the numbers are correct. Step 3: Don’t make any changes on date, check number and other settings. Step 5: Click on [Process Batch PR] button to process and print checks. · All reports are in Excel format; you may save them for your own use at your option. · Select an employee from the selection page and click on [Edit] button; change the “Vacation Used” in the blue Cell “E16”. This is accumulative balance of hours used. 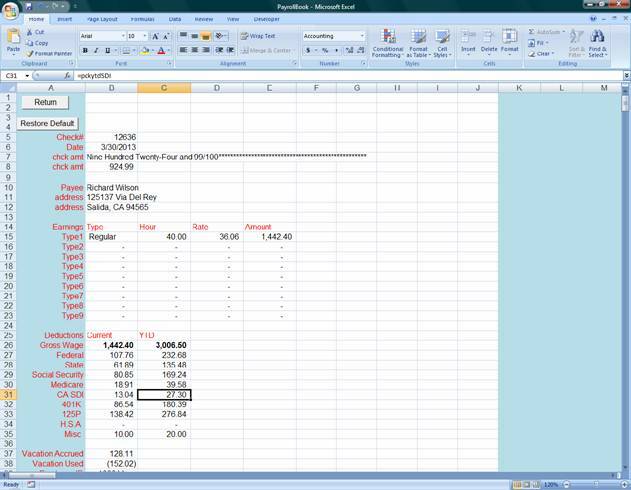 This program uses a perpetual method to keep track the vacation balance. (net balance=total vacation accrued – total vacation used). The positive balance in Cell “E16” is the hour used; not the net balance. · The second way to do is to adjust the “Length of Service”. You may change the “Date of Hire” in cell “E15” to adjust the total accrued balance. This program is on a calendar base. You must close the current year before you can select a new payroll year. To do this, from this main page click on [Setup] and then click on [Year Close], you will be prompted for warming. Click “OK” to continue and type in “Close” to confirm the closing. Once the year is closed; your current year data will be saved as “Payroll Data Year YYYY.xlsm”. If you close more than once for the same year the new file will replace the old one automatically. It is recommended to make backup files. To create a good habit of making back up files, you may need 3-5 moveable storage drives and marking them with Monday, Tuesday, Wednesday, Thursday, and Friday. If you make a payroll on Monday, copy all files onto your Monday drive or if you make a payroll on Thursday, copy all files onto your Thursday drive. Make sure you always make copies after you each payroll. You may open and use all data files for your own use. All files are in Excel format. Selection Error: If the display employee information do not match the selection please click “Selecting by” option: First, Last, Phone, Account a few times to refresh the display window. Deduction 2: All tax exemption type – Income taxes, FICA taxes, Local taxes, FUTA, and SUTA. Deduction 3: Partial tax exemption type – Such as Health Saving Account contribution. Deduction 4: Post tax deduction type – Loan Payment, garnishment and other deductions. 7. Handle Mid-year conversion: If you did a manual payroll or other system showing a record as below (John Smith), you may convert it into this Excel Payroll program. Click on [Process] button to process the total wages for the quarter and click ‘No’ and ‘No’ to defer printing an actual check. Repeat the same step to enter the 2nd quarter. Please make sure you change/edit the deductions back to normal deduction rate when you finish entering the quarterly payroll. By using the timecard option, you can not only save employees’ hour history but also can keep track of your project (job) cost, records of hours incurred on each job or project, and keep history of your employee’s timecard hours. b) JobList: It is optional. Enter your job list here and you can keep record of job costs. d) EquipmentType: it is optional. Enter your equipment type to keep record of equipment hours. After you enter all employees’ hours for the selected week, click on [Weekly Post] button to post the time. Once t he weekly posting is done, you may click on the [Return] button to the payroll page and do your payroll in batch. You can select the weeks for each payroll to process your payroll without entering hours again. Please note that a seven (7) minute rule is used in this timecard program. If the exact time is 3 hours and 8 minutes, it rounds to the nearest quarter as 3.25 hour (3 hour 15 minute) or if the exact time is 3 hours and 7 minutes, it rounds to the nearest quarter as 3.00 hour (3 hour 0 minute). W-3 information can be printed only if you select from first to last employee when you are printing W-2 forms. Partial selection of W-2 printing will be given chance to get W-3 information. You can select to print either W-2 form for employee copy or IRS red copy at a time. You will be offered to print W-3 information if you select from first to last. W-2 for employee: there are three copies: copy B for federal tax return, copy 2 for local or state tax return, and copy C for employee’s record. W-2 for IRS red copy: you must put the reprinted IRS red blank copy in your printer. It is two employees per page. · This program was designed for accounting students and for small business use only. Thus, I designed these technical data to limit the users. · You may have up to 1000 employees in the database with 200 employee in batch payroll, but if you have more than 50 active employees in the company then you are not a small business and please do Not use this program. You are not qualified for free use. · If you pay more than $458,300.00 per year to an employee or pay over 4807 per hour then you are not qualified for using this program for free or the tax withholdings will not be accurate. It is because you are not small business. · If you make more than 3640 payroll transactions per year, then you are not qualified for using this program. · If you are a non-profit organization and have more than 57 active employees or have more than 3640 payroll transactions per year, please contact me to increase or remove the limit for you.